It is no secret I love my Aztecs. When I was a student at San Diego State, school pride was average at best. At that time, amongst my friends, I was one of the more dedicated SDSU student fans as I worked for the Alumni Association, wrote for The Daily Aztec and read the news on KCR. Though in retrospect, donning an SDSU hoodie now and then, and partipating in extra curriculars didn’t hold a candle to what SDSU now knows as THE SHOW. 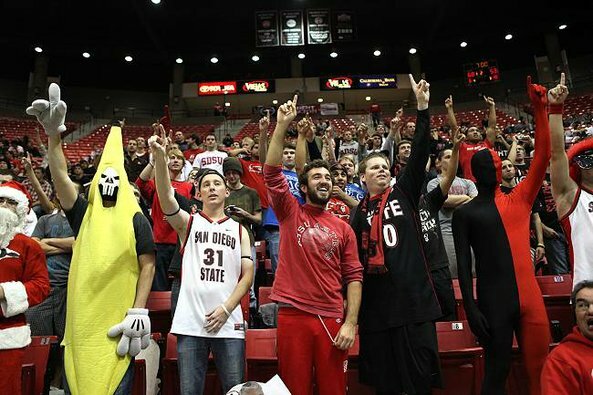 THE SHOW is SDSU’s most dedicated and loyal student section that garners attention from national news and is feared by Aztec rivals alike. These days, the entire city of San Diego has Aztec Fever. As it should as one in seven San Diegans with a college degree attended SDSU. We have a #6 ranked men’s basketball team and a bowl-winning football team. And more importantly, we are a rising hot bed of academic excellence in California. Regardless of 401K contributions, stock investments or the like, my husband and I are convinced that in 2010 our best investment (if for nothing more than for pure psychological pleasure) was our 2010-2011 SDSU Men’s Basketball season tickets. Every game we attend is a priceless experience. In fact, I can say with full conviction that the game v. UNLV this past Wednesday night was hands-down the most rockin’ I’ve ever seen that arena. (And I’ve been to Aerosmith, Prince and Marilyn Manson concerts, not to mention graduation, there). The minute I left, I wanted to do it all over again. Why? Well, the team ROCKS. The fans are die-hard. But really … THE SHOW! We have THE BEST student section, THE SHOW, in the nation. It has been spawning for at least the last six-to-ten years, but this year, as SDSU men’s basketball team is set to reign in all its glory, THE SHOW has come into its own and then some. They make the stadium, the game and the viewing experience complete. Team aside, opponents hardly have a chance in the face of this raucous and amazingly executed fan base. Long ago, on the top of Mt. Montezuma, the Aztec God of Basketball gave 10 commandments to His followers. He named his minions The Show, and He told them if they lived by these 10 rules, a legacy of epic fandom would be birthed. Interestingly enough, the God of Aztec Basketball is not as demanding as some other Aztec Gods you might have heard about. The best thing about The Show is its freedom to be unique, wild and original. These are more like guidelines. 10.) Thou shalt love the Aztecs and sit in the student section. If you do this, you’re in The Show, whether or not you know it yet. 9.) Thou shalt wear two types of attire to games: red and black, or whatever the heck you want. “Show” clothing is designed to be as funny, ludicrous and intimidating as possible. Costumes, outfits, and any accessories you can dream up are definitely encouraged. 8.) Thou shalt stand in your seats whenever the game is being played. 7.) Thou shalt cheer as loud as you can. There are many cheers and chants in The Show so try to yell in unity. 6.) Thou shalt not use excessive profanity or throw things on the court. The Show has always been clever enough to overcome these obstacles. 4.) Thou shalt show up early if you want to be close to the action. 3.) Thou shalt wave the giant heads during free throws. You can even ask for your favorite face, or make your own. 2.) Thou shalt take pride in the home court advantage. 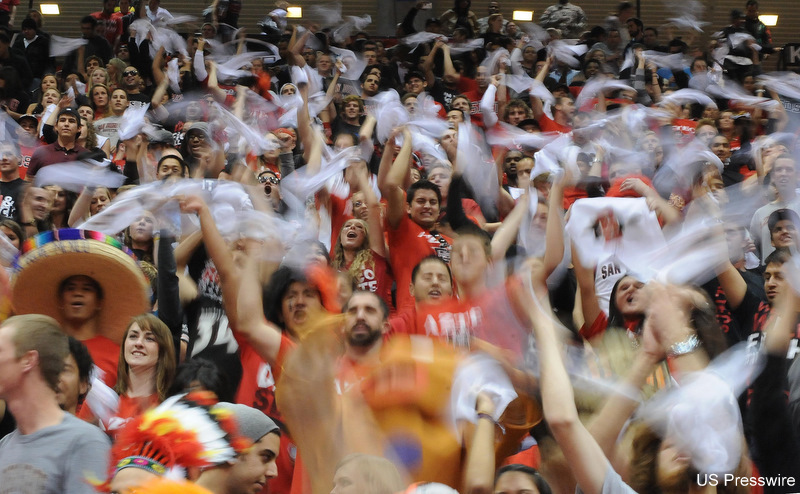 Our goal, in the end, is to do whatever we can as fans, to atmospherically and psychologically help the Aztecs get a victory at every home game. We encourage, inspire and energize the team, and you have an impact, and the players and coaches can feel it. 1.) Thou shalt love everyone in The Show. The Show is already well known as one of the craziest, loudest and most fun student sections in college basketball. That’s why the final rule is just do your part to make The Show world famous for having the most insane, rowdy and epic fans college basketball has ever seen.